Saudi Arabian folk black metallers Al-Namrood are back with their 4th full-length album “Heen Yadhar Al Ghasq“, 2 years after their previous work “Kitab Al Awthan“. The band was formed in the beginning of 2008 and has been very active since then, releasing 3 full-length albums and 2 EPs up to 2013, all by the Canadian label Shaytan Productions. 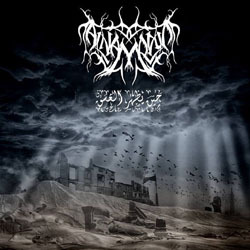 Al-Namrood’s new album is released in the dawn of 2014, once again by Shaytan, while this is the first work of the band to be released in vinyl too. The album title translates to “When Murky Sky Appears” and indeed this is a very dark album. They still play their unique Middle Eastern influenced folk black metal, using many exotic Arabian traditional instruments. Mephisto (guitars, bass) and Ostron (Arabian instruments), the only permanent members of the band, introduce us a new singer, Humbaba, the fourth different singer of Al-Namrood since their beginning! His vocals are far from the typical black metal screams, sounding more like an extreme darker version of traditional Arabian singing and I have to admit that this style fits perfectly to the atmosphere of their music. The band still has an underground aesthetic with raw distorted unedited guitars and a powerful, yet “dirty” sound. The overall tempo of the album is a bit slower, while their compositions are fully influenced by oriental scales and rhythms. Once again the unique traditional instruments make their sound totally distinctive. Within each new work the band combines metal and folk music much more harmonic and this is their best effort so far. In my opinion “Heen Yadhar Al Ghasq” sounds a little different from their previous works, since it has a darker, more brutal, almost suffocating atmosphere. Their lyrics are in their native language as expected, but not included in the CD booklet. Those who know the band, will surely embrace their new work. If you have never heard of them and you find the idea of oriental black metal interesting, then Al-Namrood is a band you should check; not only this album, but their complete discography. I personally like this band very much, since it has a very strong personality and a distinctive sound. “Heen Yadhar Al Ghasq” is released in a standard jewel-case CD version with 4-page booklet, limited to 500 copies and in a limited to 300 copies vinyl edition. The beautiful album artwork is by Luciferium War Graphics. You can visit the band’s official pages for more info and sound samples.